Where Do Ambulatory Care Nurses Work? An ambulatory care nurse refers to any nurse who sees patients in an outpatient setting. This general nurse tends to care for non-emergency patients in a medical office, clinic, health facility, or any healthcare setting where patients do not stay overnight. Occasionally there are ambulatory care wings in a hospital, but generally speaking, this type of nurse does not usually work in a hospital environment. Ambulatory care nurses see a variety of patients for things like routine care, injuries, chronic or acute illness, and more, and may specialize in things like pediatrics or other niche areas. These nurses must have astute, multidisciplinary clinical knowledge to be able to assess and expedite appropriate care. Ambulatory care is a great specialty for licensed RNs of any background, since the type of care provided can be so broad. It's also ideal for those coming out of nursing school who don't want to work odd hours or be in a stressful hospital environment. Upon earning a degree and passing the NCLEX-RN, a nurse is eligible to work in ambulatory care. With a few years of experience, they can go on to become certified in the specialty. What Are the Education Requirements for Ambulatory Care Nurses? Ambulatory care nurses are licensed RNs who have earned an ADN or BSN degree. Depending on where they are employed, or if they have a special focus, an ambulatory care nurse may need to hold at least a BSN or higher. Ambulatory nursing is a great starting point for new nurse grads to gain experience and decide if they want to specialize in anything; it's also ideal for those who know they want to work regular day-time hours. Ambulatory care nurses can work in many different healthcare settings, making it an incredibly diverse nursing path. Medical offices, government institutions, college/university health centers, home healthcare agencies, community health clinics, and group practices are just a few of the places that employ ambulatory care nurses. Some hospitals with ambulatory care units also hire this type of nurse. Lastly, ambulatory care nurses can also provide ‘telehealth' care via call centers, e-mail, or other remote means. What Are the Challenges Transitioning from Hospital Nursing to Clinic / Ambulatory Care Nursing? What Are Some of the Challenges for Nurses Working in Ambulatory Care? Ambulatory care nurses have an incredibly diverse set of day-to-day tasks. They provide care to a wide array of patients across life spans, monitor vital signs, perform phlebotomy procedures, coordinate health services, provide health education, and evaluate patient outcomes, amongst a myriad of other tasks. A large part of their job involves pain management and properly administering pain medication. Ambulatory care nurses must think on their feet and be prepared for any number of health issues that they could come across from patient to patient, ranging from illness to injury and everything in between. Aside from this, they are regularly charged with any number of managerial duties, including completing paperwork, delegating roles and responsibilities, and maintaining and adhering to rules, regulations and policies. What Are the Roles and Duties of an Ambulatory Care Nurse? Typically, there is a range in nursing salaries due to things like location, experience, education level, and more. The Bureau of Labor Statistics reports the median salary of an ambulatory care nurse at roughly $68,410 annually. 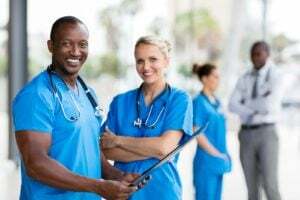 Aside from being a diverse nursing specialty, the employment outlook for an ambulatory care nurse is favorable as well. Many doctors and surgeons are now performing in-office surgical procedures where a patient does not require an overnight stay, making ambulatory care nurses highly desirable. The sheer number of employment locations also means that this type of nurse should have no trouble finding a job in a variety of different healthcare settings.